It was thought that Lil Wayne had paid his debt to society by spending eight months in prison last year. He lost nearly one year of his career at the peak of his fame. He was still able to release music that he recorded prior to entering Rikers Island, but obviously was not able to work on any new projects for the duration of his stay there. Once he came out, he took a little bit of time to readjust to being a free man. He spent time with his family and friends. He rejoined his Young Money family member Drake for a concert in Las Vegas. Then he returned to his second home, the studio. 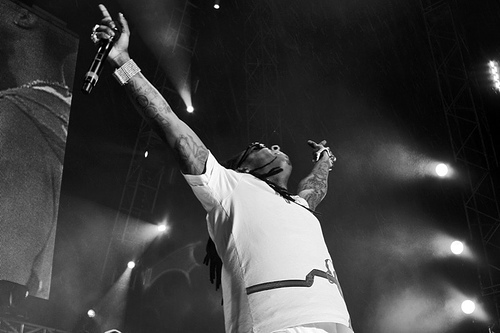 Wayne returned to the radio airwaves hard with his hit single, “6 Foot, 7 Foot.” As the song gained airplay and other songs like his freestyle, “Green and Yellow,” which is a remix of Wiz Khalifa’s “Black and Yellow,” gained popularity, Wayne decided to embark on a world tour. The tour was set to hit Europe with one official date set and a few summer dates in the works, but the artist known as Weezy found himself in a pickle. With the combination of jail time last year and other drug charges, Lil Wayne has been denied his visa to travel to England by the UK Border Agency. He was booked to perform in the English state, but now he is unable to even enter Europe for the time being. Wayne’s popularity is sky high right now. With great excitement for him in Europe, it is a matter of time until the popular demand for him outweighs the concern of British officials about letting the man who was born Dwayne Michael Carter, Jr. into the continent. Until then, Wayne has other things to worry about. On May 16th, Wayne is set to drop Tha Carter IV. The album is already being discussed by fans everywhere. Many are excited to see if Weezy can top the success of his 2008 album, Tha Carter III. Wayne is also said to be working on the Dedication 4 mixtape with DJ Drama. It is clear as day that Lil Wayne is back. While his desire to tour Europe may have been dashed due to the uneasiness felt about his criminal past by British officials, Weezy is not done making hits and showing his fans love through the music that they continue to anticipate with every passing day.